6 CE credits from the American Academy of Dental Hygiene. With holistic treatment gaining popularity among patients, it’s important for the modern dental practice to accommodate a wide variety of treatment objectives. Come learn what progressive MDs have discovered about basic holistic care and how their treatment recommendations can have a profound impact on a dental hygiene practice that hasn’t kept abreast of these medical changes. Learn how to incorporate simple, easy strategies to enhance your patient education, periodontal outcomes, and office productivity that will keep you in step with the progressive medical community, or at least a step ahead rather than lagging behind. For many years, a gap has existed between medicine and dentistry, with dentistry being viewed by medicine as a less important aspect of overall health. The recent advent of more and better diagnostic testing taught us to fall into step with the medical model. However, a paradigm shift in medicine, building in momentum, is something which closely resembles the long-standing dental hygiene model relating to inflammation and the disease process. These progressive MDs have taken what we know a step farther with acceptance of the idea if diet can cause disease, diet can also heal. Adopting a holistic approach to the traditional dental hygiene treatment model will achieve the same results. Imagine the impact upon the medical community when oral care improves oral health, with the positive side effect of improving overall health. The results can be astonishing, and finally bridge the gap between medicine and dentistry as medicine further learns what we have long known, that the mouth is the gateway to overall health. and subscribe to her blog. 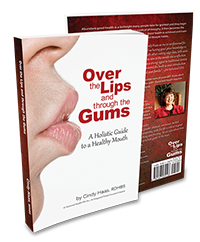 Cindy’s book, Over the Lips and through the Gums: A Holistic Guide to a Healthy Mouth, takes a look at where our collective health is in comparison to a time when life was simpler. And less toxic. It provides recipes, tips, tricks and a guide on how to make your life healthier, getting you back to your roots. American Academy of Dental Hygiene.